Another salad from Latin American Cuisine, this had overtones of sesame - and a nuttiness that we liked. Unlike yesterday's Pineapple Strawberry salad, today's dish is served warm, and somehow both me and the husband prefer warm salads to cold ones. So, if you are a fan of salads too, make this one for a potluck or weekend dinner. We had this with some Carrot Almond Soup and roasted garlic focaccia that made for a lovely meal. Warm the sesame oil a bit (not till smoking), switch off & add this to a bowl along with the rest of the dressing. Whisk well and keep refrigerated. In the same pan, add the minced garlic, broccoli florets and toss with a little salt on a low flame till the florets are coated with a garlicky glaze but are still warm and crunchy (max 2-3 mins). 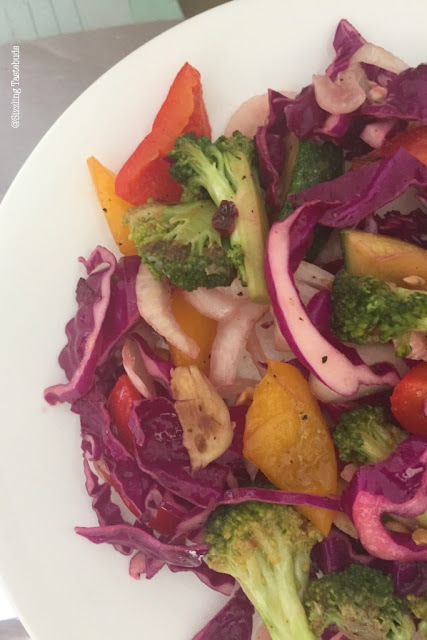 In a large bowl, add the purple cabbage, roasted bell peppers , broccoli, onion and toss well. Just before serving, add the refrigerated dressing and serve warm on the side. Unique combo ! The color contrast of both cabbage and broccoli is so pretty . A wonderful flavourful salad . Lovely Colourful salad. I like the use of sesame in dressings! That's a unique combination of purple cabbage and broccoli. Love the colourful salad. Beautiful salad. I am sure Hubby will love it. Interesting salad with catchy colours. Very healthy definitely. Healthy and beautiful salad with Lovely colours!!! Love the dressing with sesame oil. Very nice. Colorful and crunchy salad. I have never used purple cabbage in my kitchen, I guess I should try it. Salad looks refreshing.